Walnuts are considered to be a "brain food," because of the wrinkled brain-like appearance of kernels. The kernels consist of two bumpy lobes and are enclosed in round or oblong shells that are brown in color and very hard. There are many varieties of walnut such as Europe walnut, black walnut, white walnut and Japanese walnut. Walnut is one the most widely used dessert nuts and is much prized in baking, confectionery and ice cream making. Walnuts are great in salads, breakfast cereals, breads, muffins, pancakes and sautéed vegetables. Walnut oil extracted from the nut is edible and has a pleasant odour and a nutty flavour. A peep into their goodness will reveal that they are an excellent source of omega 3 fatty acids. This is a special type of protective fat the body cannot manufacture and has many potential health benefits. It is known to provide cardiovascular protection, promotion of better cognitive function, anti-inflammatory benefits helpful in asthma and rheumatoid arthritis. Walnuts contain an antioxidant compound called ellagic acid that supports the immune system and appears to have several anticancer properties. 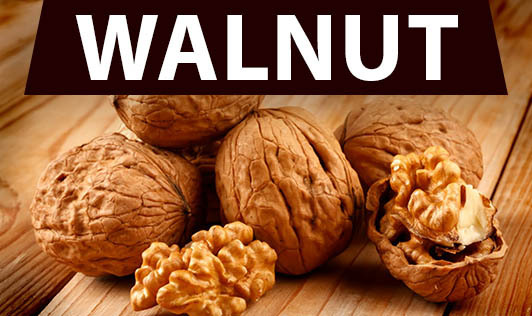 Approximately 15% of the fat found in walnuts is healthful monounsaturated fat. Walnuts are also a good source of protein, vitamin E and minerals such as magnesium, manganese and copper. The Food and Drug Administration in the US, has cleared the health claim that "eating 1.5 ounces per day of walnuts as part of a diet low in saturated fat and cholesterol may reduce the risk of heart disease".